Let me cast you back to France, the year is 1998 and the biggest sporting event on the planet is into the knock out stages. A young Michael Owen has arguably just scored one of the greatest goals in a World Cup tournament and England have one of the best teams assembled. Two footballing goliaths, one the birthplace of football and the other have given birth to the player’s greatest players. England Vs Argentina. The rivalry goes deep and is much more than football, when the sides first met in 1951 it was purely a footballing rivalry. The Falklands War in 1982 elevated this rivalry and the fixture became a more personal affair, Fights would start between fans and emotions would be running high. The 1986 World cup in Mexico saw the clash of fans as well as the two teams, fights broke out in Mexico City and England were knocked out by the Hand of God. Apart from a friendly in 1991 which Argentina won, not a lot between the two happened. The next meeting is in France, the year is 1998 and the backdrop is the Stade Geoffroy-Guichard. Diego Simone has just sent David Beckham crashing to the floor in a heavy challenge, Beckham has retaliated and kicked out. A red card followed and we all know what the fate was for the England national team. Since this incident Diego Simeone went on to become one of the brightest young managers of the decade, but just how has he got there? In 2006 Simeone retired from professional football, his last game was for Racing on 17th February 2006. On this same day he became their new manager. They finished season in impressive style and the foundations for Simeone’s style were starting to show. Passion. It had been 23 years since Estudiantes de La Plata had won their last league title, Simeone took the helm in 2006 and led them to this. This prompted him to receive the best manager award in a poll by the country’s biggest sporting newspaper. In 2007 he signed a contract to manage River Plate, the contract was only a yearlong but he had won the Clausura championship whilst there. On the 15th April 2009 Simeone joined San Lorenzo, he left a year later due to bad results and mounting criticism. The 19th January 2011 saw Simeone help Catania avoid relegation, this managerial conquest was short-lived as he returned to Racing for a second stint on 21 June 2011. Madrid is home to the biggest team on the planet ‘Los Blancos’ who have recently claimed La Decima and boasts some of the highest valued players in the world. If you drive 6 miles across Madrid from the Santiago Bernabeu you will be faced with another historic stadium, The Vicente Calderón. In this stadium lives another fellow Madrid team who for the past 4 seasons have been surprising the entire footballing world. On The 23rd December 2011 Diego Simeone was unveiled as the new Atletico Madrid manager. In his first season he guided the Rojiblancos to Europa league greatness. He then went on to win the Supercup against Chelsea in 2012 and lead Atletico to third place, their highest since 1996. The real defining season for Simeone was 2013-2014, they had lost their star player to Monaco and began the season losing to Barcelona in the Spanish Supercup. After this brief hiccup, Atletico secured a winning streak of 8 games, the best league start in its history. In the 2013-2014 season, Diego Simeone led the team to its first title in 17 years. When teams excel in one competition it is usually fair to say they wouldn’t be doing well in other campaigns. The 2013-2014 Champions league campaign was the real cause for interest, Atletico went into the final unbeaten throughout the entire campaign, they went into the final only for the second time in their history. They boasted the best defence in the competition (one of Simeone’s great tactics), they were unfortunate to lose to a resilient and hungry Real Madrid side, who also made history by reaching their tenth champions league title. Diego Simeone was sent to the stands during this defeat. His complete ethic is that team work is the recipe for success and not individuals, this contrasts heavily with their fierce rivals and probably explains why the recent results between the two teams are particular one-sided. He demands everything from his players and also gives everything to them, they respect him and would do anything for him, just as he would for them. 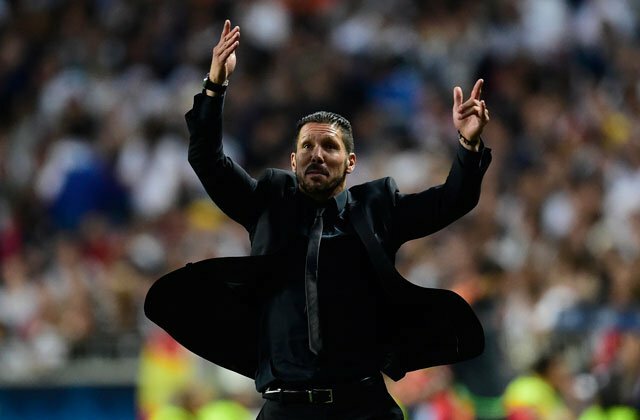 Watching the rise of Atletico and Simeone’s style he is a completely new manager, the passion is evident, he shows no arrogance and has the will to dominate any league. The work ethic and relentless enthusiasm his players show remind me of what Dortmund were like a few seasons ago. I would personally love to see him grace the Premier League at some point in the future. Justin Graham has published a new post. "Rungvisai vs. Estrada 2 Preview - Tale of the Tape and Prediction"